When you BELIEVE that all things are possible, your world changes. I have been faced with so many turns, disappointments and setbacks in my life. The average person would have given up by now, but I KNOW without a shadow of a doubt that Impossible means I’m Possible. It might not happen for anyone else, but I BELIEVE that I’m Possible. I know I am the person that a no really means a YES. I am that person that continues to try even when I don’t see a result, then something SNAPS and the goal that I had been diligently seeking happens. 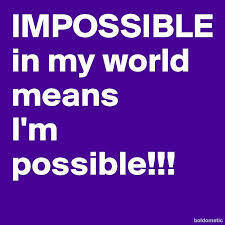 Just always see IMPOSSIBLE as I’m Possible!! !